WHY ARE PEOPLE LEAVING MY CHURCH? Discovering answers to one of our biggest problems. Sunday Night we held the first of our new monthly All Staff Gatherings with all of our ministry directors at TheCHURCH. We ate, talked, prayed, and I taught a short session on the topic of, why do people who have been plugged into the church body, unplug and leave? I know that true discipleship through assimilation is an issue that all churches deal with, so I thought that I would share what we talked about last night in the hopes of helping you, as you strive to stop the bleeding as the people you thought were with you run for the door. These are my actual notes from the session, hope this inspires some thought and a possible course of action for you and your church! Tim and his family start attending the church. They begin to get plugged in. They say how much they are loving it, and over the course of a few months slowly begin to be a part of the local body. They even begin serving in a ministry at the church. Then, out of nowhere, Tim and his family are gone. Five years ago a small team of people and myself planted TheCHURCH at Visalia. We are a body of believers giving our lives to, "Bring people to Jesus and help them live like Him". The scenario, I just described with Tim, has happened at TheCHURCH more times then I can count. No thats not true. I can count them. In fact, there have been well over 100 people including children that were a viable part of our body here at TheCHURCH, that have decided to move on and no longer be with us. I have asked myself this question so many times. In fact, about two and a half years ago I started to really become a student of this question. I had this burning passion to discover, what are the keys to not just keeping someone in the chair, but releasing them to become a disciple of Jesus in and through our local church? Before I let you know what I've uncovered, let me just say, I am not speaking tonight out of depression, doubt, or angst against anyone that has ever left our body. I have no animosity at all toward anyone. Our church is healthy, whole, growing, and full of people that are completely sold out to the cause of making disciples. My studies and observations come out of an emotionally good place as well as a hungry heart. I want our church to become even more effective at helping people fall deeply in love with Jesus. This happens best when people are a part of a local body. Here are a few things that I've discovered will not keep people in the chair or release them to be a disciple of Jesus in and through our local church? 1 - Personal interaction with me as their Pastor. You always hear that people want to be in a church where they know the pastor and their pastor knows them. However, over the past five years I have personally seen that - text and facebook messages from me - lunch meetings with me - personal invites from me - having them to my home for dinner and get togethers - visiting them in the hospital or even doing their wedding - are not the things that keeps people plugged in, growing, or making an impact. By my estimation, personal interaction with me as their Pastor gives them a 50 / 50 chance (at best) of being a long term part of our body. I still do all of these things and will continue to do so, because I am passionate about people. However, I know this is not the secret ingredient that creates devoted disciples of Jesus. 2 - Creative message titles or strong content. We work really hard to have catchy titles, good marketing, great content, and messages that inspire through the practical teaching of Gods word. However, there have been tons of people that have decided to no longer be a part of our gatherings, right in the middle of great teaching series. Faith comes by hearing and hearing the word. We will always work diligently to deliver life giving messages. However, the truth of the matter is, unfortunately, strong Biblical content has not held people in their chair or in our body. 3 - Facilities, room decor or remodels. We have remodeled rooms, updated spaces, and many people still made the decision to unplug and leave. People left during the renovations as well as after the renovations. Facilities do not make disciples. 4 - Doing special events to meet their personal needs. A few years ago, we decided to do some special events to meet the needs of some of the folks that had talked with us. We did a few woman's events as well as mens breakfast gatherings. To be honest, they were great events! They were very well attended, and everyone had a great time. However, that year we had more people leave the church in a 12 month period then any other time of our churches five year history. In fact, many of the people that unplugged were the ones that came to us saying they really needed something specific for them. Again, I am not upset or angry with anyone that has ever left. I am not speaking ill of anyone in anyway shape or form. I am trying to get to the heart of the big question. 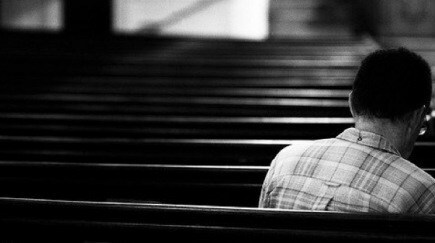 Why do people leave the church and why do they stay? We have to go deep in this. We have to figure out what are we doing in the church that is working and what are we doing that doesn't make long term disciples. Here is what I've seen. Personal involvement from the senior pastor, creative messages, facilities, and special events, will attract people to the chairs, but those things will not assimilate people fully into the body. Well to find the fix, all I need to do is look around at the people in this room. With everyone in this room there is a link, there is a string, that is woven through the fabric of our hearts. As individuals there is something that we have, that has moved us from the chair, to a leader in and through the our local church. All of you here have had personal contact from me, but so did they are they are gone. So thats not it. All of you have heard great content and creative messages that you liked. However, so did they and they are no longer here. Everyone here has been through facility changes as well as upgrades to parts of our building. The people who left experienced those same things as well and they decided to move on. You all have enjoyed special events gatherings and services. Some of the folks who are no longer with us not only experienced those services, they helped put them on. You experienced the same things they did, however, they are gone and you are still here. Why? Why are you here? What kept you from unplugging and wandering away? The best way to answer this is by tackling the question I’ve been focussing on for the past two and a half years. What are the keys that not only keep people in the chair but release them into the body? 1 - Clear understanding of who we are and what we are doing. Who are we and what are were doing? We are TheCHURCH. We are here to, "Bring People to Jesus and help them live like Him". We do this by gathering on the weekend, growing in groups, giving to Gods kingdom, and going back out into our world. We will do this with a strategic mission to have multiple campus locations making disciples in clusters of communities, wherever God would open the door. 2 - Mutual desire to see the mission come to pass. I know this is the mission of TheCHURCH .... and you know what …. I want the same thing. I want to Bring People to Jesus by gather, growing, giving, and going. I also feel the best way to make disciples is instead of having one church that reaches 5,000 people, is to have 10 churches of 500, that are reaching 5,000 people. This is what the church wants and I want the same thing. Amos 3:3 - How can two walk together unless they be in agreement. Brian Houston once told a story of a gentleman in his church that said, "I’ll get behind your vision pastor!" Brian told him, "Thats not good enough. Getting behind my vision is not enough. Until my vision becomes your vision. Unless this becomes our vision together, it will never work. Because, you will not be here long enough to be a part of what God is going to do". Here is the third one …. 3 - A spot on the team. In a survey I once read, most basketball players stated, they would rather get playing time on a team that has a losing record, than sit on the bench and watch on a team that wins the championship. The reason for this is, people want to know that they am valuable. They want to know they matter. People want to be a part of something that they are actually involved in. Here is a very important thing that I've seen first hand. "A spot on the team" can’t be the first thing we offer when someone starts becoming a part of the church. A spot on the team has to come after the person, clearly understands the mission of TheCHURCH and has a mutual desire to see it come to pass. When Tim starts coming to the church, if the first thing we do is offer him a spot on the team. Serving in the kids ministry. Serving one the worship team or serving in first impressions without him first clearly understanding why we here and knowing he wants the same thing. He will serve for a while and then be gone. This is not good for Tim or the body of the church. We gave him a jersey before he really understood what we are playing for. He does not fully trust the coach of the team. He does not know or trust the other players on the team. Because of this he will soon take off the jersey and go play for another team. It’s not my vision. It is not your vision. It is our vision. That is why you are here. That is why you are making the impact you are making. We as a church have to get better (and we are working on new systems and ministries) to give current and new people a clear understanding of who we are and what we are doing. We need to have a process for them to wrestle with the question, "Do I want the same things as the church?" If they do, then we quickly give them a spot on the team. As ministry departments here are two questions for you to wrestle with and answer. 1. How are you giving a clear understanding of who we are and what we are doing as a church through your ministry department? 2. After a person realizes they want to go the same direction as the church, how quickly are you getting them a jersey and into the game? 1 - Do you have a problem with people unplugging from your church? 2 - How many people have left over the past two years? 3 - What are the things that you did that you thought would keep them growing with you long term? 4 - What are the systems you have in place to let people know who you are and what you are doing? 5 - How quickly do you get someone on the team once you know they have a mutual desire to see the mission come to pass?